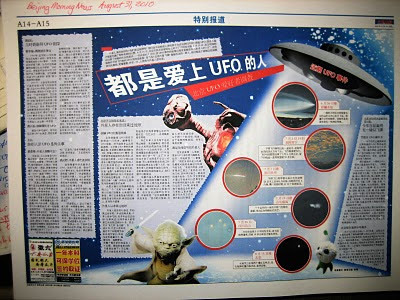 Residents of Beijing were greeted today with this feature in the Beijing Morning News (August 31st 2010) which brought together some of the recent UFO imagery doing the rounds in Chinese media and a survey of comments from some of Beijing's diverse community of UFO watchers - Zhou Xudong ("saucerer's apprentice" to Zhou Xiaoqiang, Beijing UFO Research Association's secretary general), Wang Zheng (science background reflecting on the group's more amazing cases such as the Phoenix mountain experience (presumably Meng Zhou Guo, but not stated in the article) and River Forest (which was like Tunguska on a much small scale)), Bejing Planetarium curator Zhu Jin (wwho was saying aliens exist but they just come here, and was suggesting the Leshan 3 "sun" photo was more likely an indoor photo with reflection aspects) and the group's "UFO detective" Zhou Xiaoqiang, whose approach seems pragmatic. He argues many of the recent cases are not about genuine UFOs. He was recently involved in the Hangzhou airport affair which involved some dubious photos (the one show here was of an aircraft). There is a lot of UFO interest in China and certainly a lot of stuff to keep up with. Interesting times.